I weighed this morning: 185.0. 184.5 is the lowest I’ve been, so I’m pretty happy that my summer of stress is ending on such a positive note – virtually no change, yeah – but for a lifelong stress/emotional eater who is ending a summer of high stress and is about to start a new school/program/job? That’s a win. I’m somewhat surprised that I’ve been able to pull this off. Honestly, though, I don’t think I give myself enough credit for my altered/reduced portions, the exercise, or the general BALANCE that I’ve achieved that has allowed me to deal with high levels of stress and come out (mostly) on the other side unscathed. 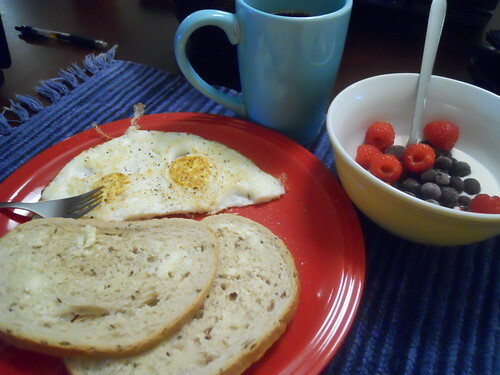 Breakfast this morning = eggs, lightly toasted (really, just warm) rye, fruit + yogurt. My mom flew up from FL to visit – and arrived around lunchtime – so we went out to lunch together. Mine = (according to the website) grilled turkey pastrami, Applewood smoked bacon, artichoke hearts, red onions, fresh bruschetta tomatoes relish and a creamy pesto spread. 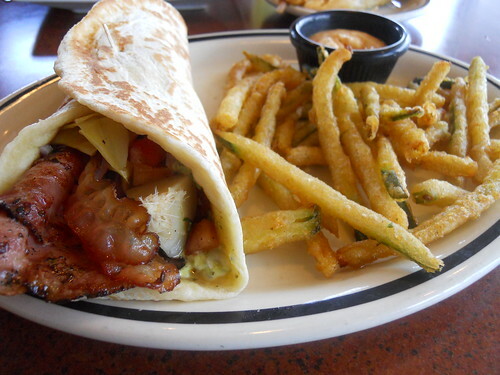 Plus zucchini fries. Jon made dinner for us. 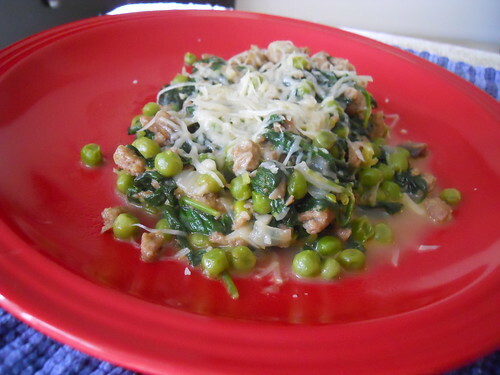 Turkey sausage, spinach, mushrooms, peas, onion, parmesan cheese. We used to eat this pretty regularly with bow-tie noodles, but they’re not even missed anymore.